This morning, I noticed more Monarch butterfly wings on the ground below the butterfly bush. This only means that they died overnight. I picked them up and decided to look at the tree to see if I could explain why this is happening. 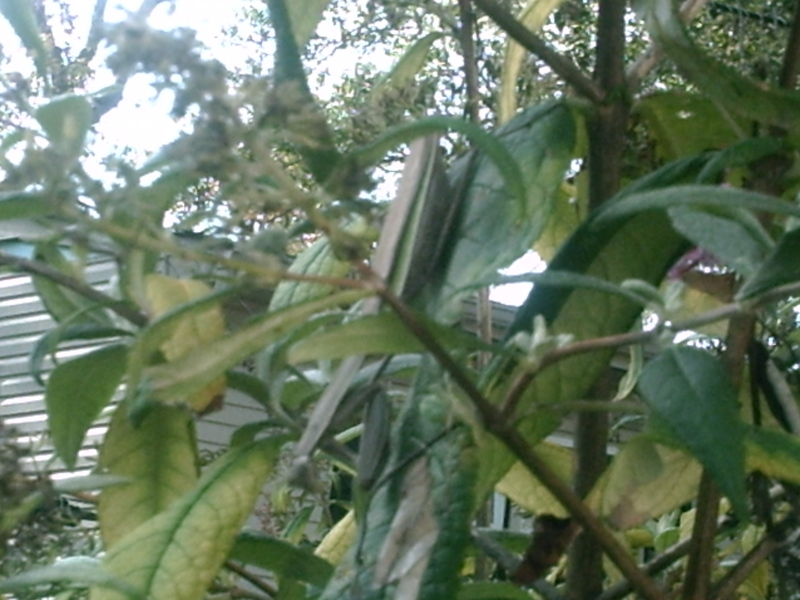 It wasn’t until I was checking out the butterfly tree for a second time around that I noticed a green leaf move slowly. I checked it out and there it was – the culprit, a Preying Mantis. Although Monarchs are supposed to be poisonous, this little guy seems to have found a way around that. Here is a picture of my little guest (not so little) who is having a huge food fest. It is a bit tricky to see the Mantis because she is perfectly camouflage. Focus on the center of the picture and there it is, in a vertical position heads down. So the mystery is solved, and although I still feel sad about the fate of the butterflies, at least I am glad that the Mantis is surviving – it is the natural course of things, the cycle of life. I love Monarch butterflies, all butterflies really, well, even the praying mantis… thanks for the info, I am surprised that a prayeing mantis eats butterflies. I was surprised as well, as I had learned that Monarchs are poisonuos to insects, birds and mammals because of the larvae Milkweed diet. I was surprised to have found that about the Mantis. Thanks for visiting my blog.